STIGA is a leading Sweedish brand which we know and love here so we are delighted to have in stock the all new SMT266 Multi Tool. Easy start system with 30% less resistance at the starter cord. Nylon tap & go cutting head attachment. 3 tooth metal brushcutter blade. Hedgecutter attachment - 400mm in length with 25mm tooth spacing. Pruner attachment - 250mm / 10" bar with front screw tensioning. Manufacturers RRP £299.00 including vat. So why not get the versatility of several machines and the convenience of only having 1 engine unit to service & maintain. Comfortable and easy to use whichever attachment is fitted, the Stiga SMT-266 Petrol Multi-Tool employs shock-absorbing materials for fewer fatigue-inducing vibrations and comes with a shoulder-strap that lets the user’s body take some of the weight for less tiring gardening. The engine is a premium 25.4cc unit that puts out an impressive 0.9hp; and which employs cutting-edge technologies that work to reduce emissions and fuel-consumption with no compromise on performance. Stiga’s Easy-Start system means you’ll be ready for action after the gentlest pull on the starter-rope; while their use of a highly effective sponge-type air-filter ensures season after season of reliable operation. The brushcutter attachment can also be fitted with with a line-head, but comes with a 25.5cm three-tooth metal blade for tackling more challenging vegetation, like nettles, bramble and scrub. A solid 8mm drive-shaft ensures optimum torque-transfer when brushcutting. The pruner attachment comprises a compact 25cm guide-bar with a sprocket-nose for reduced ‘kick-back’ tendency. Features include automatic chain-oiling for smooth operation and a clean cut; and a simple screw-based chain-tensioner for fast in-the-field adjustment. The fast-working double-sided blades on the hedgetrimmer attachment measure a generous 40cm in length and have a substantial 25mm tooth-gap that delivers a neat, bruise-free cut in thicker growth. 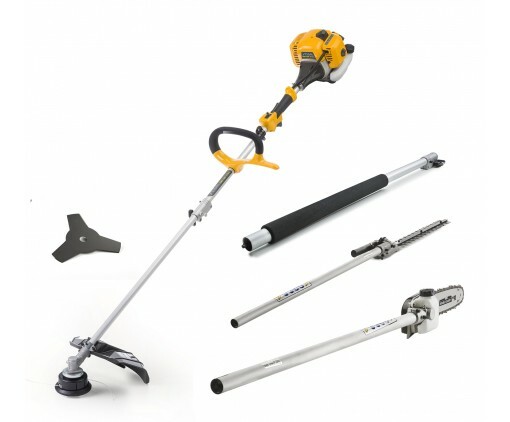 Fit the 70cm extension pole when using the hedgetrimmer or pruner and you’ll be able access the tallest hedges and highest branches without resorting to ladders. Better still call in and see for yourself.